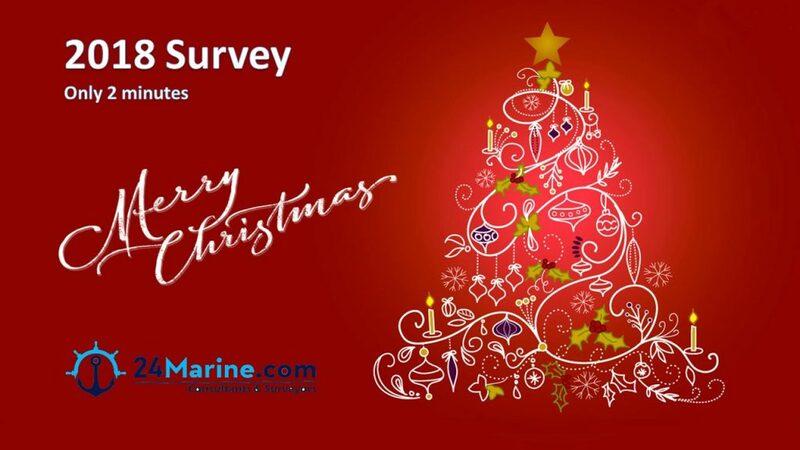 Now we are ending 2018, we would your valuable opinion about Marine Surveyors Services!!! Interesting investigation from U.S. National Transportation Safety Board (NTSB). The U.S. NTSB has determined that an insufficient preventative maintenance program and lack of guidance for responding to engine high-temperature conditions, led to the January 14, 2018, fire on board the small passenger vessel Island Lady, in the waters of the Pithlachascotee River, near Port Ritchey, Florida. • Tropical Breeze Casino Cruz’s lack of guidance regarding engine high-temperature alarms led to the captain leaving the port engine idling, rather than shutting it down, leading to the fire. • The lack of a requirement for a fire detection and suppression system in an unmanned space containing engine exhaust tubing prevented early detection of, and a swifter response to, the fire in the lazarette. • The captain’s decisions to return to the dock and to subsequently beach the Island Lady were prudent and increased the likelihood of survival for those on board. • The failure of the port engine’s raw-water pump led to overheating of the engine and exhaust tubing. • The raw-water pump’s failure resulted from Tropical Breeze Casino Cruz’s failure to follow Caterpillar’s recommended maintenance schedule. • The Island Lady’s crew had insufficient firefighting training. • The use of plastic tubing on local tank level indicators and lack of automatic shutoff valves on the fuel tanks resulted in the release of diesel fuel, which contributed to the severity of the fire. • The U.S. Coast Guard did not correctly assess the Island Lady’s fuel system’s compliance with applicable regulations during an inspection of the vessel. 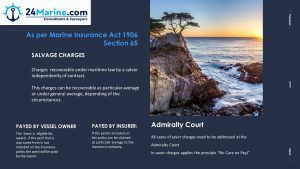 Here a extract of the Marine Insurance Act Section 65. Good reading and take note of the lessons learned. This unfortanate incident caused by two vessels no folowing communication protocols. Which of the two vessel is responsible? (http://www.MaritimeCyprus.com) Shipping is the lifeblood of the global economy, transporting 90% of global trade. Allianz Global Corporate & Specialty (AGCS) recently released its annual report, Safety & Shipping Review 2018. The report highlights cyber, climate risks and human error as the main factors threatening shipping’s safety progress during the 12 months prior to December 31, 2017 (full report can be downloaded at the bottom of this article). Shippers continue to grapple with balancing the benefits and risks of increasing automation on board. The NotPaetya cyber-attack caused cargo delays and congestion at nearly 80 ports, further underlying the growth of cyber risk. Changing climate conditions bring new route risks, particularly in the Arctic and North Atlantic Waters – over 1,000 icebergs drifted into North Atlantic shipping lanes last year. 94 large ships lost worldwide in 2017, down by more than a third over 10 years. Bad weather involved in 1 in 4 losses. 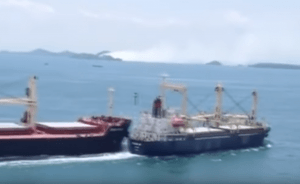 Accident hotspot – South China and South East Asian waters lost 30 ships. Large shipping losses have declined 38% over the past decade, according to Allianz Global Corporate & Specialty’s (AGCS) Safety & Shipping Review 2018, with this downward trend continuing in 2017. Recent events such as the collision of the oil tanker “Sanchi” and the impact of the NotPetya malware on harbor logistics underscore both the traditional and emerging risk challenges faced by the shipping sector. There were 94 total losses reported around the shipping world in 2017, down 4% year-on-year (98) – the second lowest in 10 years after 2014. Bad weather, such as typhoons in Asia and hurricanes in the U.S., contributed to the loss of more than 20 vessels, according to the annual review, which analyzes reported shipping losses over 100 gross tons (GT). Ever-larger container ships pose fire containment and salvage issues. Changing climate conditions bring new route risks, particularly in the Arctic and North Atlantic waters. Environmental scrutiny is growing as the industry seeks to cut emissions, which brings new technical risks coupled with the threat of machinery damage. Shippers continue to grapple with balancing the benefits and risks of increasing automation on board. The NotPetya cyber-attack caused cargo delays and congestion at nearly 80 ports, further underlying the growth of cyber risk. Nearly one third of shipping losses in 2017 (30) occurred in the South China, Indochina, Indonesia and Philippines maritime region, up 25% annually, driven by activity in Vietnamese waters. This area has been the major global loss hotspot for the past decade, leading some media commentators to label it the “new Bermuda Triangle.” The major loss factors are actually weather – in November 2017, Typhoon Damrey caused six losses, busy seas and lower safety standards on some domestic routes. Outside of Asia, the East Mediterranean and Black Sea region is the second major loss hotspot (17) followed by the British Isles (8).There was a 29% annual increase in reported shipping incidents in Arctic Circle waters (71), according to AGCS analysis. Cargo vessels (53) accounted for more than half of all vessels lost globally in 2017. Fishing and passenger vessel losses are down year-on-year. Bulk carriers accounted for five of the 10 largest reported total losses by GT. 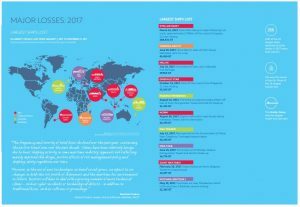 The most common cause of global losses remains foundering (sinking), with 61 sinkings in 2017. Wrecked/stranded ranks second (13), followed by machinery damage/failure (8). Analysis shows Friday is the most dangerous day at sea – 175 of 1,129 total losses reported have occurred on this day over the past decade. Friday the 13th really can be unlucky – three ships were lost on this day in 2012 including the Costa Concordia, the largest-ever marine insurance loss. Human Error: Still a big issue. Data can help. Despite decades of safety improvements, the shipping industry has no room for complacency. Fatal accidents such as the “Sanchi” oil tanker collision in January 2018 and the loss of the “El Faro” in Hurricane Joaquin in late 2015 persist, and human behavior is often a factor. It is estimated that 75% to 96% of shipping accidents involve human error. It is also behind 75% of 15,000 marine liability insurance industry claims analyzed by AGCS – costing $1.6bn. Moving forward, better use of data and analytics could help as the shipping industry produces a significant amount of data, but could utilize it better to produce real-time findings and alerts. New insights from crew behavior and near-misses can identify trends as predictive analysis may be the difference between a safe voyage and a disaster. Despitehuge improvements in maritime safety, fatal accidents at sea persist. Human error continues to be a major driver of incidents and captains and crews are under increasing commercial pressure as supply chains are streamlined. Tight schedules can have a detrimental effect on safety culture and decision-making leading to the“normalization of risk”. Better use of data and analytics can help to address this. The shipping industry has learned from losses in the past but predictive analysis is important for the future. New insights from crew behavior and near-misses can help identify human error trends. Sensor technology can also enhance risk management. For example, hull stress monitoring sensors could be linked to ship navigation in bad weather, feeding real-time information on structural integrity. However, over-reliance on technology on board must be avoided. Continual training is imperative to ensure the right balance is achieved between technology and human intervention. Major fires oncontainer vessels are one of the most significant safety issues. The blaze on the ultra-large container ship (ULCS) Maersk Honam in March 2018 is one of a number of incidents in recent years. Issues driving container ship fire exposures include the adequacy of firefighting capabilities as vessels become larger, misdeclaration of cargo, salvage challenges and time taken to access a port of refuge. ULCS provide economies of scale but the industry needs to ensure risk management standards are up to speed, as larger container ships are on their way. Hurricanes Harvey, Irma and Maria (HIM) and other severe weather events in 2017, such as Typhoons Damrey and Hato, show traditional maritime risks should not be overlooked. AGCS analysis shows bad weather directly contributed to at least 21 total losses in 2017 and this could yet increase further (see page 9). Fuel market, cargo, cruise ship and port operations were also disrupted, leading to natural catastrophes being ranked the top risk by shipping experts in the Allianz Risk Barometer 2018. Shippers need to consider scenarios where multiple locations are impacted when drawing up contingency plans. Cyber incidents like the global NotPetya malware event have served as a wake-up call for the shipping sector. Many operators previously thought themselves isolated from this threat. At the same time, new European Union laws such as the Network and Information Security Directive (NIS), which requires large ports and maritime transport services to report any cyber incidents and brings financial penalties, will exacerbate the fall-out from any future failure – malicious or accidental. Autonomous shipping and drones: Legal, safety and cyber security issues are likely to limit widespread growth of crewless ships, for now. Human error risk will still be present in decision-making algorithms and onshore monitoring bases. Drones and submersibles, however, have the potential to make a significant contribution to shipping safety and risk management. Future use could include pollution assessment, cargo tank inspections, monitoring pirates and assessment of the condition of a ship’s hull in a grounding incident. While underway a main engine low fuel pressure alarm sounded on the bridge. The crew member on watch entered the unmanned engine room and identified a high-pressure fuel leak spraying on the port engine’s turbocharger. There was also a large quantity of diesel fuel in the bilge. The Master arrived on scene just as the fuel ignited and began a fire. He attempted to extinguish the fire using a portable fire extinguisher, but without success. He activated the general alarm, secured the hatches, had crew members secure the ventilation dampers and closed the remote fuel shut-off valves to the engine room. The fire then quickly self-extinguished. 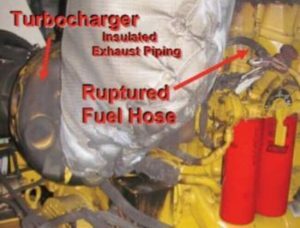 The investigation identified the source of the fuel leak as a rupture on a flexible fuel hose connected to the fuel filter assembly. The fuel filter assembly and its components were installed relatively close to the turbocharger on the inboard side of the engine. The heat radiating from the turbocharger components was very high and probably led to the degradation of the rubberised hoses nearby. However, the installation was in accordance with the manufacturer’s marine engine manual. Closely inspect fuel and lubricating systems, from source tanks to system endpoints. Think about system vulnerabilities such as loose or missing pipe clamps and securing devices, wear or chafing from vibration that is affecting hoses, and pipes or tubes that may be poorly secured. Make sure that plastic piping is not close to hot spots. Ensure all insulation, blankets and lagging are maintained and kept tight. Look for areas where released fluids may make contact. Where spray shielding is used, check that it is kept in place; if it is not used, consider adding shielding.